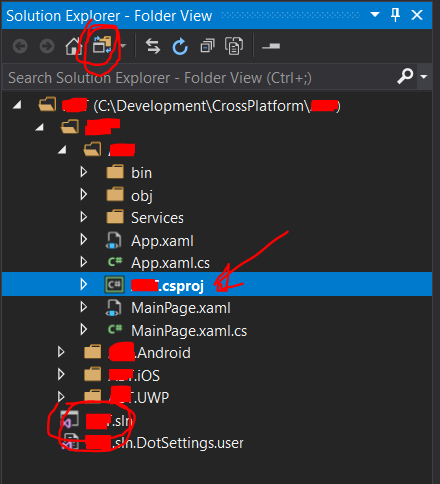 I have VS2017 create a new project for cross platform then follow all steps but .sln and .csproj file are not found . Something is wrong with your install - Because it works for everyone else. FULLY install Visual Studio - every option, workload, extra, package - EVERYTHING. Something might be wrong with your install like the accepted answer says. More likely it's how you have your view setting set up on your solution explorer. I noticed this same thing on my install of VS2017. It's not that the files aren't there, they're just hidden in the solution explorer. Click the button at the top of the solution explorer to switch to folder view, and there they are. See the attached image.